Enjoy Special Removals Deal on Every Tuesday! CBD Movers is a well-established removalists company in Australia, having more than fifteen years of exhaustive experience in the movers and packer’s industry. We are enjoying years of leadership in deploying high-quality moving and storage solutions to our customers in all major cities and suburbs of Australia including Melbourne, Brisbane, Adelaide, Perth, Canberra, and Sydney. Our real moving strength comes with highly experienced and committed staff, state-of-the-art moving equipment, and a large fleet of well- equipped trucks, and as a team, we are instrumental in delighting our customers. At CBD Movers we utilize advanced methodologies and fully-equipped systems to deliver top-notch moving and storage solutions for residential, commercial, and furniture removals, dismantling and re-assembling of large furniture items, removal of Industrial machinery, electrical appliances, medical equipment, and much more. We offer licensed and insured Two Men and a Truck (8 ton) transport and removal services for residential and business possessions, safely from origin A to destination B without any extra surcharges or hidden costs. Our movers work as a team to take care of all phases of the box-hauling process right from sorting of excessive stuff, careful packing, unloading, unpacking, and erecting all belongings in the new place. Enjoy An Amazing Deal On Tuesday! Get Two Men and a 8 Ton truck at a flat rate of $110 only, available in all major cities and suburbs of Australia, including Melbourne, Brisbane, Adelaide, Perth, Canberra, and Sydney. You can avail this special offer every Tuesday. 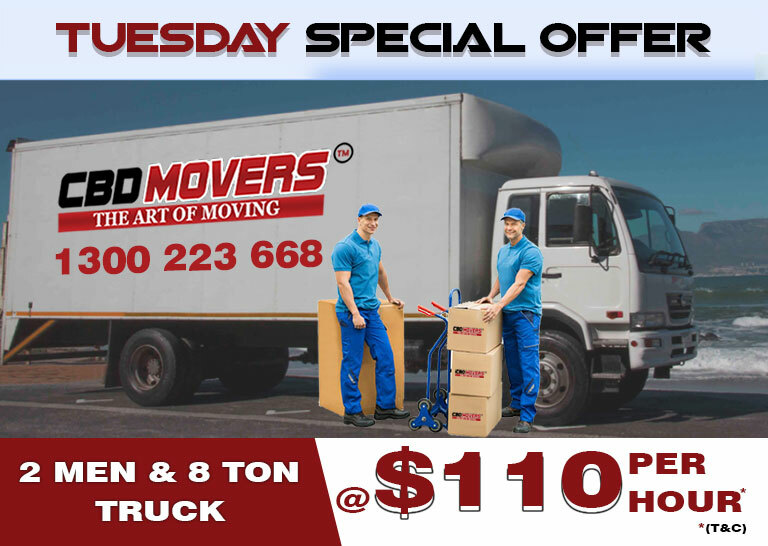 To know more about this exciting deal of ‘Two Men and a 8 Ton Truck’ visit us www.cbdmovers.com.au or call on 1300 223 668. No Coupon code required. Hurry, this deal is available only for a limited period!! Previous PostPrevious Do You Really Need To Hire Furniture Movers Canberra?